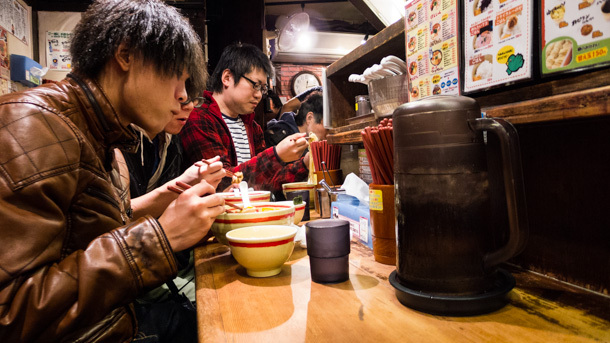 Kyushu Jangara (九州じゃんがら) is a chainlet of Tokyo ramen shops sought out for their rich, Hakata-style tonkotsu. 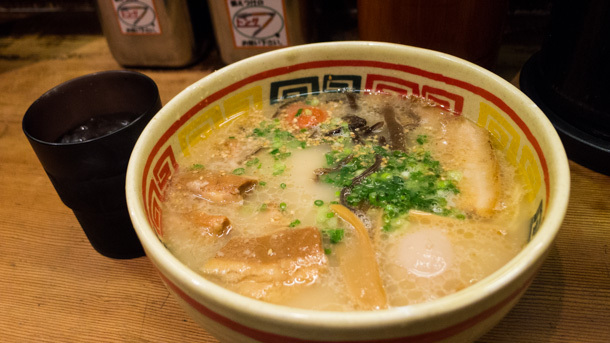 Though not as intense as something you might be served at a Nakasu yatai, it’s a far more jacked up rendition of the northern Kyushu specialty than the cleaned up and smoothed out interpretation found at Ippudo. 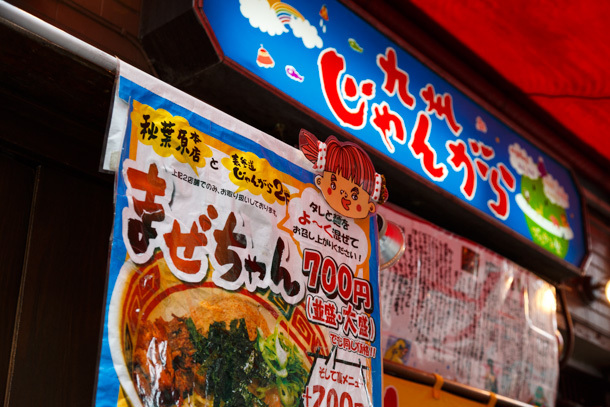 There are locations scattered around Tokyo, but tucked away between maid cafes and DVD shops in a side alley off Chūō-dōri just up the street from the Akihabara retail district is the honten (本店)—main or original shop. 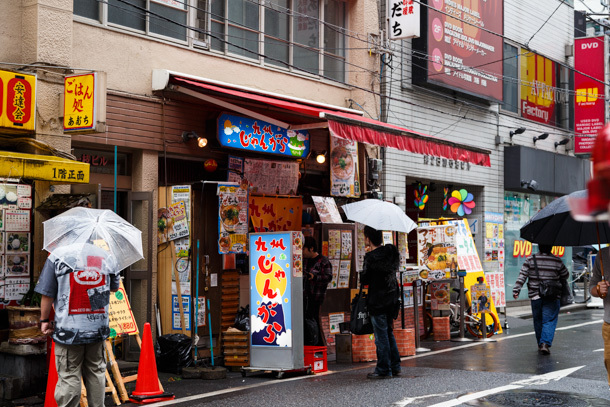 On a cold, wet day, the bright red awning and colorful signage, and promise of pork bone euphoria inside, beckon. 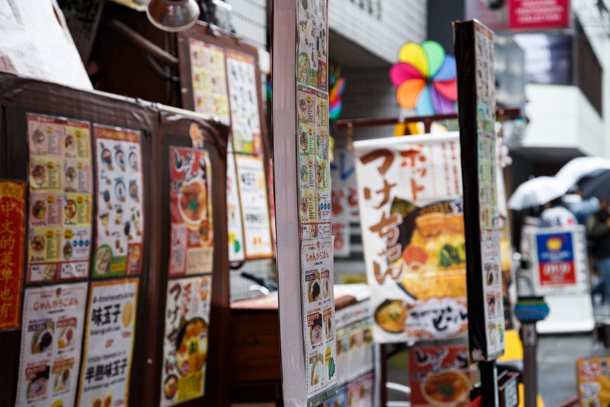 The menu, with its extensive lists of options and add-ons, is both a marketing device and a service optimization tool. 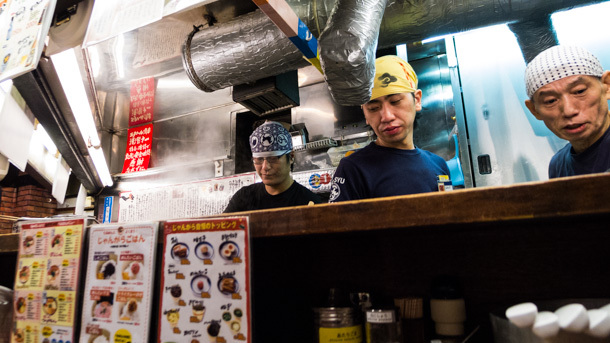 When things get busy, which essentially means everyday at meal times, the staff streamline flow by taking orders of patrons waiting in line, so that the right ingredients are queued up the moment you pass through the noren. The colorful hand-drawn pictures also give you something interesting to look at while you wait. 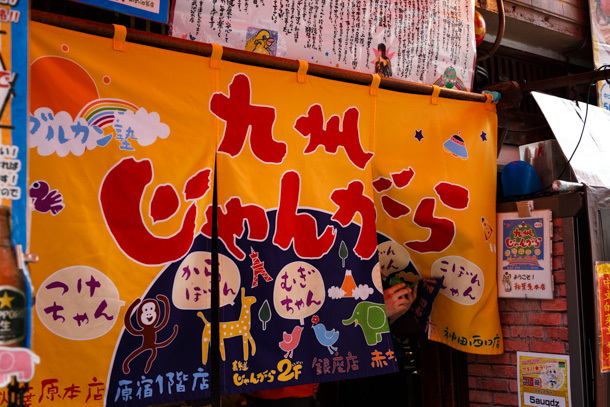 In addition, many of the customers would likely have come from either an event or therapeutic shopping escapade around Akihabara, so the atmosphere can be downright bubbly. 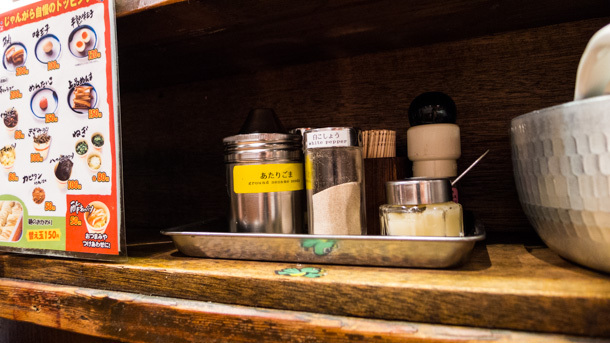 The tiny shop necessitates ducking and squeezing to just get through the entryway, as well as slipping into one of the 10 or so stools in the windowless compartment. It is the polar opposite of the 73 seat monster branch in Harajuku. You’ll be greeted with an Irasshaimase, but rather than the boisterous, we’re making a performance out of this variant, it’s more like a “we’re glad you’re here, watch your head” kind of tone. You’ll be touching shoulder to shoulder with the patrons on either side of you. 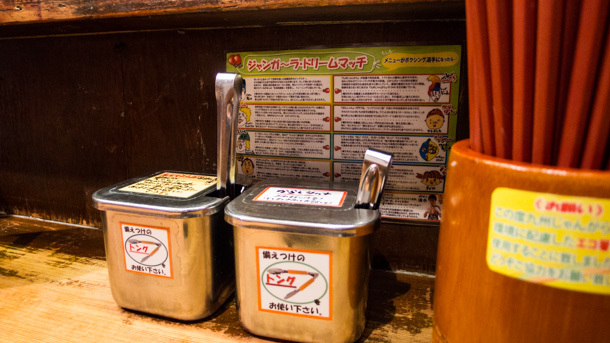 Customization is encouraged with Hakata ramen. Ground sesame seeds, white pepper and crushed garlic are common spiking agents. You can also lace your bowl with benishoga (pickled ginger) and karashi takana (pickled, spicy mustard greens). 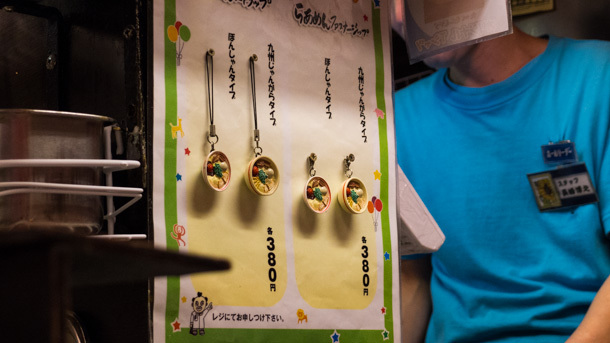 A Jangara ramen keitai strap for diehard acolytes. 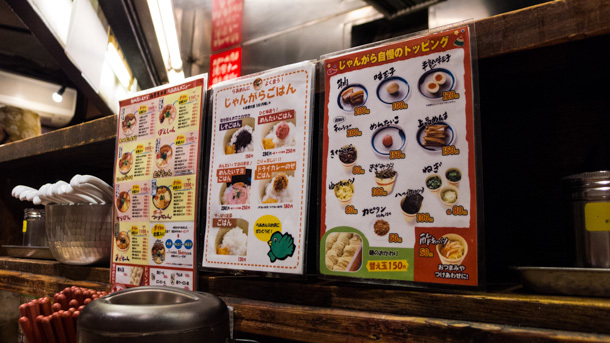 A wintertime trip to Fukuoka is up there near the top of my bucket list. 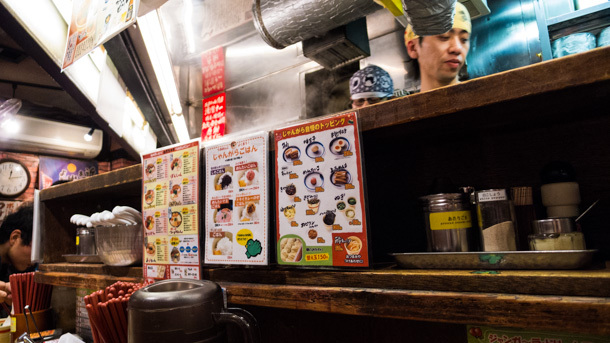 Queued up along the Nakasu River on a cold night, chatting up rosy cheeked compatriots, then huddling over a steaming bowl of rendered fat and collagen, is one of those unique experiences at the intersection of place and culture for which there is no substitute. Until then I have Jangara, which, by my reckoning, delivers all the warm and fuzzy comfort an otaku could ask for. 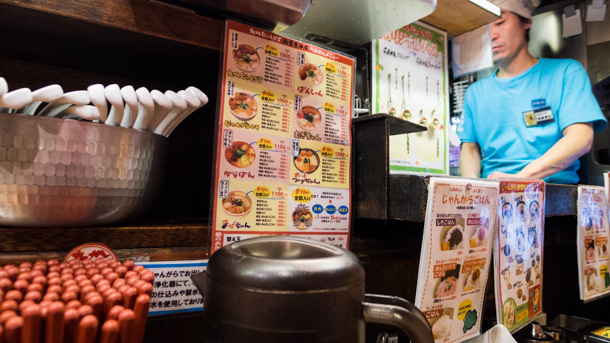 This post is part of The Tokyo Project. Click here to go to the introduction and table of contents.